FINANCIAL CRISIS OR HUGE OPPORTUNITY ? Bill, will the Wolfe Wave continue to work in this financial crisis? Short answer: Who would you trust, Mother Nature or the politicians? The Wolfe Wave is a natural rhythm that constantly repeats. Waves have no idea that there is a financial crisis. Mother Nature just produces larger waves. I alerted students, in a copyrighted lesson, to be prepared for a bearish wave to form. I taught them how to lay out the wave in advance so that they would be prepared when the price hit the 5 point. Among other rules, I also taught them how to determine the proper time frame. On 10/9/08 I alerted students, in a copyrighted lesson, that a bearish wave did indeed form. I followed the precise rules that I teach and drew the 5 points and the Target Line. (See chart below.) On 10/10/08 the price hit the Target Line. The price fell from the 5 point, to the Target Line, in three market days for an incredible move down of 174 (big) S&P points! Thank you for the warning, Mother Nature. Does this look too simplistic? Of course it does. It took me almost 30 years to discover where to properly place the numbers. I can teach it to you in two weeks. I alerted students, in a copyrighted lesson, that a large bullish wave had formed (chart not shown). I reminded them of a previous lesson which taught where resistance could be expected on the chart. On 11/4/08 price hit that area of resistance. From bottom to top it was an incredible move up of 172 (big) S&P points. I alerted students, in a copyrighted lesson, to be prepared for a bearish wave to form on a 15-minute time frame. Indeed, a bearish wave formed a few hours later that nailed the target line. From top to bottom it was an incredible move down of 44 (big) S&P points. I alerted students, in a copyrighted lesson, that a bullish wave was forming on a 15-minute time frame. 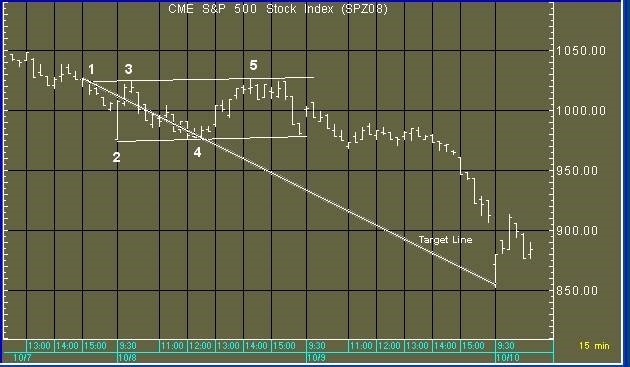 On 11/18/08 a bullish wave formed that nailed the target line. From bottom to top it was an incredible move up of 57 (big) S&P points. I alerted students, in a copyrighted lesson, that a bearish wave was in the process of forming. A bearish wave did indeed form. The price then fell and hit the target line. From top to bottom it was an incredible move down of 68 (big) S&P points in less than four hours.